The "WoggleBug" is a random voltage generator, originally designed by Grant Richter of Wiard Synthesizers. It is a continuation of the "smooth" and "stepped" fluctuating random voltage sources pioneered by Don Buchla within the Model 266 "Source of Uncertainty," expanding it to include the other-worldly Woggle CVs (stepped voltages with decaying sinusoids edges). 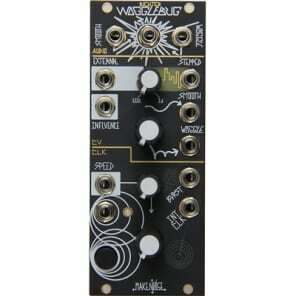 The Wogglebug is a very musical random voltage generator where it is possible to synchronize all random signal to a Master Clock. Guaranteed to unleash your synthesizer's ID MONSTER!